PolyDome is offering a whole new breed of observatory dome. . . the Explora-Dome! 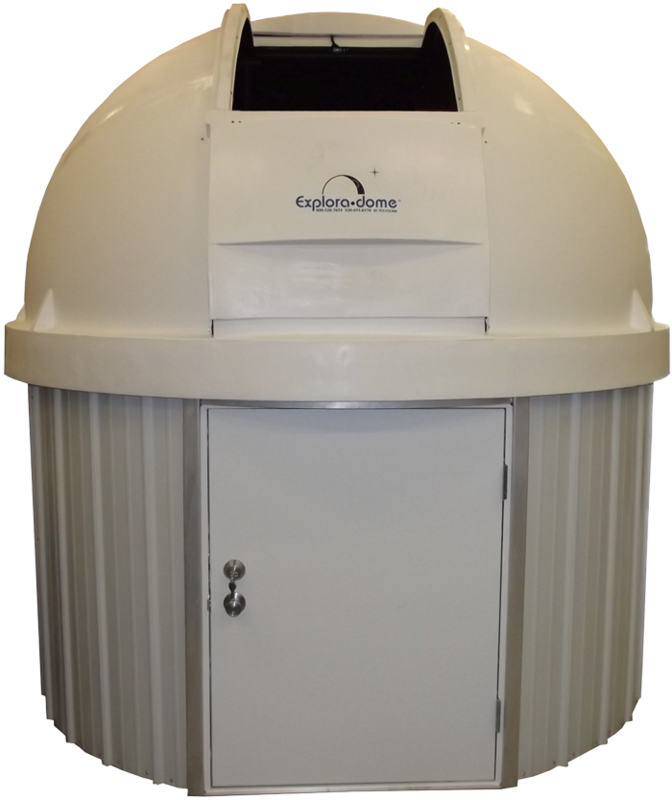 Unlike our competitors in the market today, the Explora-Dome is a truly affordable, virtually indestructible, maintenance free observatory dome. Now you can afford to sit inside a true observatory sheltered from the winds and annoying neighbor’s porch lights. No more need to haul your equipment out, set it up, and then when you are finished, break it down and haul it back inside. The Explora-Dome is rotomolded as a one piece unit. It is manufactured of very strong, UV stabilized polyethylene plastic. The observatory features a two door shutter system: the lower shutter door flips outwards, while the upper door glides open and closed. The Explora-Dome has been designed to allow the owner to add modifications and enhancements of their own choosing. Buyers of the dome can choose their own means of rotation and design a building that suits their needs. The difficult task of creating the dome has been done for you. All the Explora-Dome surfaces and doors have a minumum 1/4″ thickness and yet it weighs in at a mere 180 pounds. Polyethylene is extremely durable; it has a higher impact resistance than fiberglass, aluminum and even steel (no more hailstorm worries). It’s coefficient of friction is lower than nylon and comparable to Teflon; making it slippery enough for easy cleanup and snow will slide right off the dome. Polyethylene is 100% recyclable so it is environmentally friendly. Best of all, you aren’t sacrificing quality for price. Fiberglass takes hours and hours of laying up the resins and glass. That is why they cost so much. Explora-Dome is molded and easily duplicated reducing the cost to an affordable level. The Explora-Dome is 97-inches in diameter and 54-inches tall including the skirt; 48-inches from the skirt lip to the top of the dome. The door opening is 29-inches wide. It is tall enough to sit comfortably inside. To allow standing inside it is suggested that you mount the Explora-Dome on the top of a structure at least 48-inches high with some sort of lockable door access. Mounting the Explora-Dome on a track will allow greater ease of rotation. With the Explora-Dome the do-it-yourself observatory dream comes true! The cost is low enough that an observatory is now within reach of many who thought they could never own one. The hard part is completed and you can add just the finishing touches you want. Polydome allows the individual astronomer to choose the features they want, rather than limit them to a particular design. This allows you to be as budget conscious or as extravagant as you desire. Accessories such as Roof Transition Skirts allow mounting the Explora-Dome on a variety of building shapes.